I know I've whined about my old aching body in the past - and actually this isn't new. 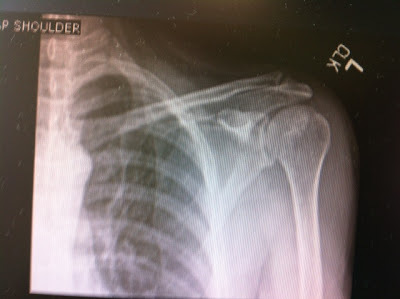 I recall mentioning my painful left shoulder in posts about my gym workouts over the last 2-3 years. Since I am a guy, I just figured I'd power through the pain, but after 36 months, I finally arrived at the fact that it might not be going away. Especially since a few weeks ago, I couldn't even raise my arm 30 degrees, let alone get it over my head. I don't get it - some days I can lift a 50lb dumbbell and others I can't get a gallon of milk out of the refrig. Or hold a Warrior 2 pose in yoga without thinking I can't keep my arms up any longer. I had myself convinced my rotator cuff had a tear. The stories I've heard of surgery are harrowing, but I've also heard of just physical therapy and / or cortisone injections. I had finally had enough and saw an orthopedic doc - a non-surgeon, as I didn't want them springing to the chance to cut. As it turns out, I lucked out. No tear in the rotator. Bonus! But I do have something called "impingement syndrome" which could be a precursor if not worked on. Now I have a prescription for physical therapy. Now I need to make and keep the appointments. Normally that is not a problem, except for the next three weeks I'm barely at home. One of the odder things is the ortho doc and going though my issue. First, he told me not to sleep on the arm, which is the side I sleep on. "Don't do it", says he, but it's hard to undo a lifetime behaviour, no? The other one was when asking about lifting. "Why do you want to lift that kind of weight anyway?". Now, this is a good looking doc and many ortho docs are ex-jocks (not to stereotype), but the question stymied me. I had no response that didn't make me out to sound like a vain douche. So while all answers formulated in my head, too much time had passed for me to actually answer - though maybe it was meant to be rhetorical. He moved on. So, now we'll see what PT has to say. I won't be seeing my old physical therapist, Adam. I'll be heading down to the JCC to get it done. They have a good PT program, but here is hoping they can help me - you know, sometime in November when I have availability. Oh yeah, I like how you can see my lung under my rib cage. Cool. Impingements come on slowly, and also go away slowly. Don't fret. Takes about 6-9 months in some cases, but progress is usually obvious right away. I see Jesus in your lung. Good luck changing your sleeping position. It might help if switched sides of the bed. Sounds dumb but I've heard it helps. I have been trying to sleep off the L side for some time, but after years of such, it is hard to turn over. If you duct tape a rubber ducky to the left side of your ribcage, it will stop you from rolling over on that side. See, people say I'm not helpful. Granted, I'm nowhere near the advanced age you are, but when I had my herniated disc back in '05 my doc told me to sleep on my back. It took awhile to make it a habit, but now it seems natural. And it's much better for your spine, and other parts, I'm guessing.